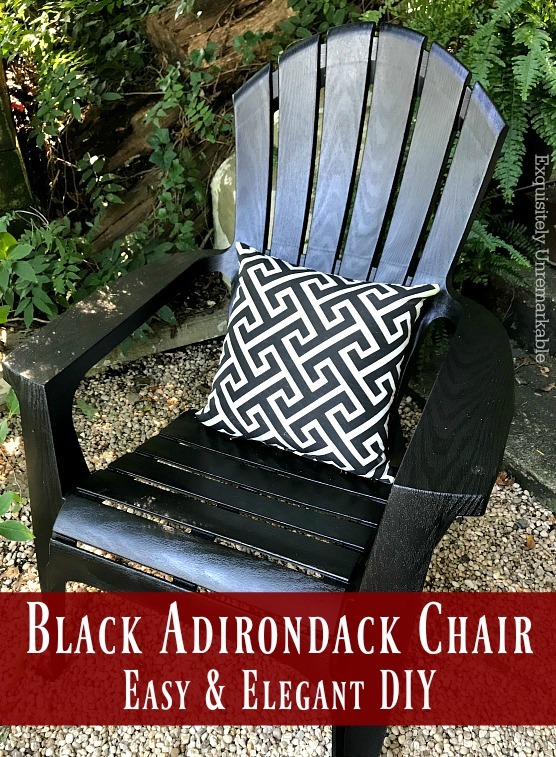 Grab an inexpensive plastic Adirondack chair from the local hardware store and give it an elegant makeover with black spray paint for your shaded garden or patio area. This weekend, I was having brunch at my friend Liz's house. It was a beautiful late September day at the beach so we ventured outside for a bit to her elegant patio area. 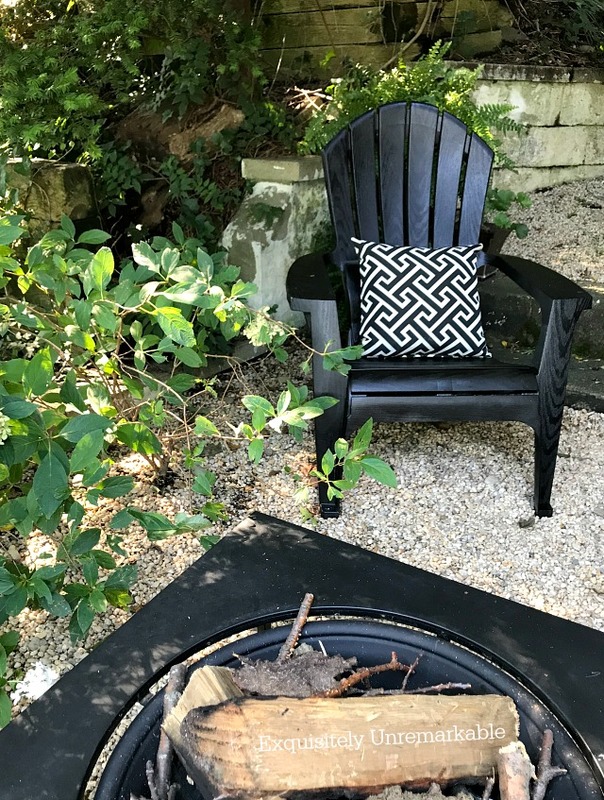 Nestled into the hillside, overlooking the water, Liz created a fabulous sitting area, complete with a fire pit and four very stylish black Adirondack chairs. I was immediately smitten. But not at all shocked. 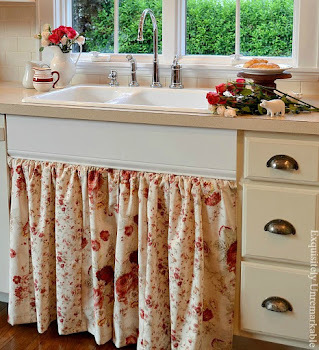 I have featured Liz's design handiwork before. Hers was the first cottage tour I posted about when I began this blogging venture many years ago. She has a polished modern style that's warm and classic. Inside or outside, no matter where she lives, the rooms alway look like they fell out of a magazine shoot, but feel like home. Obviously her patio is no exception. Budget conscious and very handy, she painted these bargain priced chairs because she couldn't find black ones. They are available in wood for a hefty price, but not plastic. We pondered about it for a minute and figured it was because the black plastic would probably be way too hot to sit on in the sun. However, since her garden patio was tucked into a shady spot, that would never be an issue. She said it took, many cans of spray paint and she herself was covered in almost as much of it as it took to cover the four chairs. Either way, the result of her hard work is nothing less than perfect. 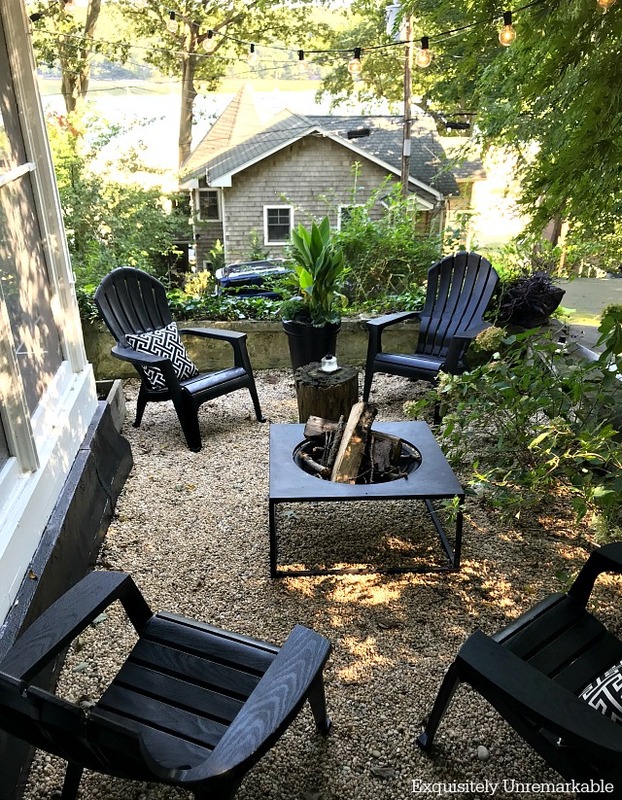 The black chairs, rustic candle topped stump, black planter, patterned pillows and string lights combine to create a charming gathering spot. A magical place to enjoy cocktails with sandy feet in summer or hot cocoa in big sweaters during the fall. And while you can barely see it due to the glare, yes, that is the harbor in the background. Not a bad set up. No matter what color the chairs are. Before you go, I'd like to thank everyone who cast a vote for Exquisitely Unremarkable in the 2018 Amara Blog Awards. This year the top five shortlist winners in each category were chosen by a combination of votes and the judges' input. Thanks to all your support, I've been included in the Top 5 US Craft Blogs!! I'm so grateful and frankly very blown away. The final vote and award ceremony with be held in London later this month. While I would love to attend, it's a tiny bit too far to travel for one evening. Although, UGG is sponsoring the craft bloggers and boy, would I love to see what they pop into the swag bags! Thanks Stacey! I’ve had them both, too and I agree, plastic lasts…and red? Fabulous! The black chairs look so elegant and pretty. What a nice spot to sit outside with your friend. Thanks Julie! It really is a dreamy spot. Enjoy this beautiful weekend! First...Congratulations on being in the Top 5! A well deserved accomplishment! Those chairs look fantastic in black. I have several of them in assorted colors, but the black brings them to a whole other level. Your friend did a great job! Thanks so much, Gina!! I wish I could go to London…how fun would that be? And those chairs, yes, totally agree. They are next level gorgeous! Everything is beautiful in our friends home. I love the open feel and the light that comes in her windows. Plus the black and white together is so pretty. Congrats on getting to the finals for the award. I think they should send you a swag bag even if you cannot go. Thanks Kris! You'd love her new place...everything is painted a lovely light gray. And I agree, wouldn't it be nice if UGG sent my bag home? Haha. If only!! I love the result!The black color give A touch of elegance to the chair. You did an excellent work! Thanks so much, Marisa! I will pass your lovely words on to Liz. Enjoy the weekend! What I'd give for that spot close to the water! You're right, that shady nook looks perfect. I kind of miss my shady nook. But not the trees tearing down the fence. Can't have it both ways. Brenda, I truly live in one of the loveliest places on earth and I never take that for granted. Her view is a gem and her design skills are the icing on the cake! Hi Kim, the chairs look great sprayed black. I would be lost without my spray paint. Have a great weekend. Spray paint is awesome, Linda, I agree. Magic in a can! Enjoy the weekend! First, GO TO LONDON!! How many of us would love the opportunity?? You can share it with us. Heck, we ought to start a GoFundMe account to send you. Who's in?? The chairs are great. The setting doesn't hurt. Oh Nancy! It would be lovely, wouldn't it? Alas I don't have the wanderlust gene....but thank you for the kind words. And I agree, the setting doesn't hurt. Congratulations for being in the Top 5. I love those chairs ... very nice. I hope that you have a nice weekend. Thank you, Teri!! And agree, very nice chairs. Even if they're not red! What a great idea! I want to spray paint everything black lately, so this is a perfect idea for me. Her patio looks cozy for any time of year. I don't blame you...black is such a great color...so much elegance and pop! What a sweet spot for visiting! It's good to have friends like that. :) I love the black chairs. Spray paint can transform almost anything. Classy black chair DIY . . .
And oh my . . . the setting . . . The chairs look amazing and so excited for you on making the shortlist! Well deserved! Thanks so much, Kristy...and yes, aren't those chairs just stunning? Spray paint truly is magical. Congratulations on your award! I haven't been following your blog for very long, but from what I can tell you definitely deserve it:) And yes...those black chairs were a great idea. Her space is so beautiful and tranquil. In fact, I'm now off to check out her blog!!! Thanks so much, Cheri, your words really do mean so much. I've been doing this for five years and enjoying every minute of it...but if someone told me I'd ever win an award from it one day - or even be considered for one - I never would've believed it. Congratulations Kim! And I’m with Nancy? GO to London! And while you’re at it tour the Cotswolds. :). I love those chairs! Those pillows are pretty also...the whole area is wonderful. We are still working on just the right feel for our small outdoor space. Those chairs are a great idea since we have limited space...may be running this by the hubster! 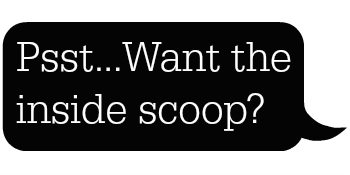 It would be a great project for him! :-) Love and hugs! Aren't those chairs great, Benita?? They match your decor...and they stack! Hugs to you!! Congratulations my friend... well done. I like the outdoor space. It is something what a few plants can add as well. Thanks Carla!! And yes...plants really do make the space. Congrats on your nomination Kim! I think those chairs are very chic no matter how many coats of paint it took! Thanks so much, Mary...and paint...amazing, right? What an amazing honor, Kim, and well deserved. And I like the painted chairs, could spend a very happy afternoon there with tea and conversation. Michelle, you are super sweet...thank you so much my friend. Beautiful spot to lounge!! Congratulations on the top 5, I don't know why you are not the TOP 1...you are in my book! I have some plastic teal ones and they are already looking yucky! I will have to try the black spray paint. It doesn't come off on your clothes if it gets hot? I don't believe so, Tammie. I mean I haven't tried it with black, but I have spray painted lots of other dark patio chairs before and they've all been fine. I think you need to use the correct paint like Rustoleum or Krylon meant for outdoor temps.